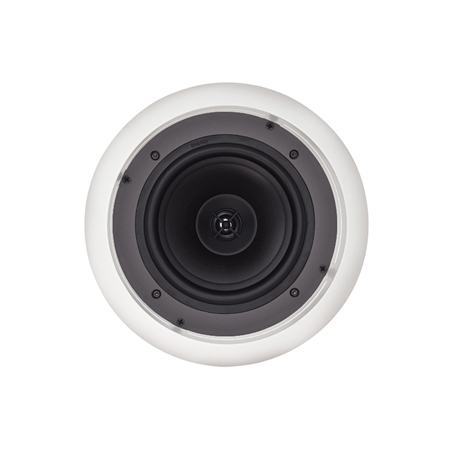 The Synergy Series SCR-2 in-ceiling speaker provides great Klipsch sound easy installation and outstanding reliability making it one of the best values available in architectural audio. The SCR-2 is a two-way speaker that employs a 6.5-inch IMG woofer and a 1-inch aluminum dome Tractrix® Horn tweeter. The 360-degree rotating horn lets you point the sound at the listening area just like a traditional enclosure loudspeaker. A -3dB tweeter attenuation switch gives you better sound control and is conveniently located just behind the grille. While it looks very different the SCR-2's drivers sonically match all Synergy Series models delivering the same wide dynamic low distortion performance.